Airport Lounge Access – Delta SkyClubs: Cardholder is allowed free when flying Delta same day. Extra charge for guests. Airport Lounge Access – Priority Pass Select Lounges: Priority Pass Select member plus two guests are allowed free entrance. $100 in Saks Fifth Avenue Credits: Up to $50 in credits each year from January through June; and another $50 July through December. $200 Dell statement credits (beginning Feb 2019): Full details haven’t yet been released. First authorized user free: Add one Platinum authorized user for free. Add up to 3 more for $175. Invest with rewards: Liquidate Membership Rewards points for 1 cent each when deposited to your Morgan Stanley brokerage account. $500 anniversary spend award: Spend $100K in a cardmember year to get $500. If you spend exactly $100K per year, that amounts to a bonus of half of 1 cent per dollar spent. $550 Annual Engagement Bonus for Reserved Clients: To qualify for Reserved status, a client’s household must have and maintain a minimum of $1,000,000 in eligible assets and liabilities or have paid at least $10,000 in managed fees/commissions. Details here. Note: To get this card you must have a Morgan Stanley account. Fortunately, a low-end Morgan Stanley Access Investing account works fine. $100 to $200 statement credit: Receive a $100 Card statement credit if your qualifying Schwab holdings are equal to or greater than $250,000 or receive a $200 Card statement credit if your qualifying Schwab holdings are equal to or greater than $1,000,000, when measured following Card account approval and annually thereafter. Invest with Rewards: Liquidate Membership Rewards points for 1.25 cents each when deposited to your eligible Schwab account. Note: To get this card you must have a Charles Schwab account. Fortunately, even a no-fee checking account is fine. And, incidentally, Schwab has one of the best no-fee debit cards around with no foreign transaction fees and it reimburses ATM fees. Bonus Points for Spend: Earn an additional 5,000 Membership Rewards points for every $20,000 in eligible purchases on the Card, up to 30,000 additional points per year. Thanks to this benefit, with exactly $20K spend (or a multiple thereof up to $120K), this card earns 1.25 points per dollar. First Year Free: 0 introductory annual fee for the first year for the primary cardholder and Platinum authorized users. Note: The waived first year annual fee is usually instead of a welcome offer. This is awesome for those who have had the card before since the waived fee is not excluded in that case (whereas a point bonus usually would be). Update: As of 2/6/19, the first year fee is no longer waived. See: Dead: Waived-fee Ameriprise Platinum offer. Note: The requirement that you are an Ameriprise customer is not enforced. Each of the consumer Platinum cards charge a $550 annual fee, and you can add up to three Platinum authorized users (AUs) for $175. The Business Platinum card charges a $595 annual fee (beginning Feb 2019), and each Business Platinum employee card costs another $300. The following table shows the total amount paid depending upon the number of Platinum cards you have with each account. Note that with consumer Platinum cards you can add authorized user Gold cards for no fee, and with the Business Platinum card you can add employee Business Green cards with no fee. That said, the Gold and Green cards have few perks whereas the authorized user Platinum cards get full airport lounge benefits, elite benefits, Global Entry reimbursement, Boingo Wifi, and Gogo inflight wifi passes (business cards). Some of the differences between cards show above are hardly worth mentioning. For example, the Morgan Stanley card lets you cash out points at 1 cent per point value. I don’t recommend that unless you really need the cash. You should be able to get far more value for your points. Annual Fees for two: If you want or need 2 Platinum cards, the Morgan Stanley Platinum card is the cheapest option since it offers the first authorized user card for free. Annual Fees for a family: If you want or need 4 Platinum cards, the consumer cards are much cheaper than the business cards since the former charges just $175 per year for 3 authorized user cards, whereas the Business Platinum card charges $300 per employee Platinum card. Annual Fees for five: If you want or need 5 Platinum cards, the Morgan Stanley Platinum card is the cheapest option since it offers the first authorized user card for free and the next three for $175 altogether. First Year Annual Fees: The Ameriprise Platinum card wins hands down with no first year annual fees See update above under the Ameriprise section. That said, the rest of the consumer cards currently offer a 60K welcome bonus which is arguably worth much more than the waived annual fees. $200 Uber credit annually (consumer cards only): If you ride Uber regularly or use Uber Eats, this can be almost as good as cash. For others it may be nearly worthless. $200 Dell credit annually (business card only — begins Feb 2019): This is a very specialized benefit, but obviously valuable if you use it. 35% Pay with Points rebate (business card only): This used to be the killer feature of the Business Platinum card when it was a 50% rebate. With a 35% rebate, points are worth about 1.5 cents each. That’s good, but hardly a show stopper. Gogo inflight internet passes (business card only): These can be quite valuable if you use them. $100 to $200 statement credit (Schwab Platinum only): If you already have a lot of money invested with Schwab, or if you can easily move your investments to Schwab, this is a nice perk that effectively lowers the annual fee by $100 or $200 per year. $550 Annual Engagement Bonus for Reserved Clients (Morgan Stanley Platinum only): If you have a million dollars invested with Morgan Stanley, you’ll qualify for Reserved status which means that they’ll refund the $550 annual fee for your Morgan Stanley Platinum Card membership. Which Platinum card is best? A business Platinum card is best if you highly value Gogo internet, the 35% Pay with Points rebate, or the $200 Dell credits (coming Feb 2019). Amex is also introducing a “WeWork” benefit in Feb 2019, but that appears to be for one year only. A consumer Platinum card is best If you highly value the $200 Uber credits, $100 Saks credits, and the ability to earn 5X directly with airlines. Which consumer Platinum card is best? The Morgan Stanley Platinum card is best if you want to add a Platinum authorized user (since the first AU is free), or if you have over $1M in assets with Morgan Stanley (since you’ll get $550 back). The Charles Schwab Platinum card is best if you prefer cash back over travel rewards (since it lets you cash out points at 1.25 cents each); or if you have a lot of money invested with Schwab since you’ll get an annual kickback ($100 for $250K invested, or $200 for $1M invested). The Ameriprise Platinum card is best if you want to try out the card for a year. For the first year, the card is free for yourself and up to three authorized users! Update: This has ended, as indicated above. If you are serving on active duty in the military, then get any or all of the cards since Amex will waive the fees upon request. Call the number of the back of your card and tell them you are serving on active duty military and had heard that AMEX offers to handle your account in accordance with the Servicemembers Civil Relief Act. Noteworthy perks: This card includes all of the great perks that come with the American Express Platinum Card, plus: ⚬ Use Membership Rewards® points for deposits by Schwab to your eligible brokerage account. (For example, 10,000 points = $125) ⚬ $100 credit with Schwab holdings of $250,000+ or $200 credit with holdings of $1,000,000+ on approval & each year. FM Mini Review: In my opinion, this is the best of the consumer Amex Platinum cards when you need two cards thanks to Morgan Stanley offering one free authorized user. Unfortunately you do need to have a Morgan Stanley account to apply. The Morgan Stanley Platinum card gets one free authorized user. One thing to add about the Morgan Stanly “flavored” Platinum card is that you can add one additional Authorized User for free! I’m seriously considering getting the Morgan Stanly version and keeping it so my wife and I can both have the benefits for the $550 annual fee. Very useful summary. There are some odd nuances that one has to remember, like that you can’t get 5x on airfare with Business unless you go through Amex Travel (not hard, but annoying to remember). The other thing that you might point out is that for those of us who haven’t been thrilled by the $100 AF increase on the personal card, but who do get some things out of it that we would miss, and who are coming up for renewal in the next few months, we can still lock in the $450 AF for another year while acclimating ourselves to the new Uber benefit. I have not been an Uber user, but with $245 in potential “free” rides over 15 months, I’ll try to work at least some of that into my plans. Similarly, this gives a little time for those of us in PHL (and maybe elsewhere) to see whether the roll-out of Centurion clubs works as a substitute for AA clubs. This is relevant to the link between the personal card and the $175 for additional users, which may turn out to be worth holding onto for couples/families where Centurion club access is frequent and reliable. A last thing: Amex Offers can sometimes differ across the cards. For example, I had a $35 Offer for boxed.com on the Business Plat that did not show up on the personal one. I don’t know if the concierge service for the Business Platinum is appreciably different than the one for the consumer Platinum cards. I’ll have to research that. Amex Offers: Its certainly true that offers for personal and business cards sometimes differ. But its also true that they can differ between any two Amex cards you have. I haven’t seen any evidence to suggest that the offers on Platinum cards are any better than those on fee-free cards. So, personally, I’d rather ratchet up my collection of fee-free cards (and AU cards with those) for the purpose of getting Amex Offers. That way you can consider the costs and benefits of Platinum cards on their own merits. This was my thinking, I have had personal plat for about 3-4 years with 3 authorized users. 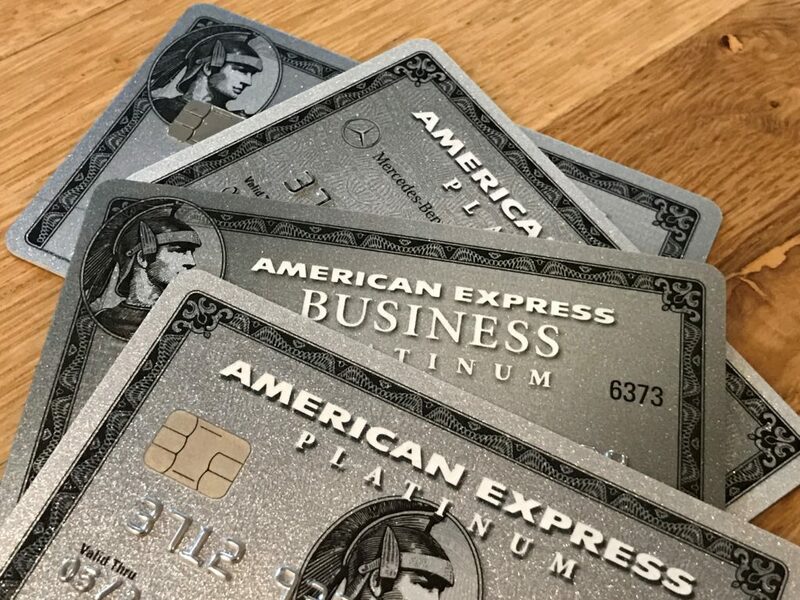 I have spent very few of my MRs points which keeps me wondering whether i should cancel but having the 4 cards with great Amex offers keeps me around. The 50% rebate had me wondering if I’d be better off switching, but seeing the fee for AU so much more makes me want to stay with personal. Lowes, Whole Foods (was a while ago), Home Depot, Royal Caribbean, Frontpoint Security? Finally, thoughts on whether the 50% rebate will ever appear on the personal Platinum card? 1) Lowe’s: Definitely had one of the $10 back on $50 or $20 back on $100 type offers the last time it was offered. 2) Whole Foods: Never seen one, but I don’t remember the last Whole Foods offer. That may have been before I had a biz plat (and I don’t live near a store, so it’s equally possible I ignored it). 3) Home Depot: Only offer I’ve had has been the 2x points at HD towards the end of 2016 and now for all of 2017. When there is a targeted HD offer, I never seem to get it on any of my cards — so I don’t know as though I’m the best resource on this one. 4) Royal Caribbean: Definitely got this on my Biz Plat last year. Added it, but didn’t end up making a booking. We had been kicking around the idea of a cruise and crunched the numbers, so I know I had it (on both primary and AU card). 5) Frontpoint Security: Shows on my Biz Plat right now. As to whether the 50% rebate will ever appear on the personal, we have no idea whether that will happen. If you’re asking me for a prediction (and you understand it’s only marginally more reliable than your magic 8-ball), I’d guess that we will not see that benefit added to personal cards any time soon. My guess is that it’s not an accident that they are charging different fees on personal vs business and rolled out separate sets of benefits. I think they are testing the market. Whether they are looking to find what costs them the least or what seems to excite card members the most or how these benefits affect applications/daily use/retention is for someone else to guess. So my bet is that it’ll be at least a year before we see one of those major benefits (uber vs 50% rebate) cross over. I think it’s equally likely that they are looking to give us a reason to carry both cards. Of course, I could be totally wrong. Hard to know. If all you’re looking for is extra cards with Amex Offers, you could always add Green cards to a Business Platinum. They won’t get any of the Platinum benefits, but they’d get Amex Offers if that’s your main concern. I updated the post to add that the Morgan Stanley card offers a free authorized user. The funny thing about this is that when I was doing the research for this post, I thought I saw that Morgan Stanley had removed that benefit. So I actually changed our Best Offers page to edit it out. Oops! Now I’ll go add it back in! Ameriprise also gives you up to 3 free AU I believe. I have two on mine right now for free but I think you can get a third. I believe that the Ameriprise AUs are free only for the first year, but please let me know if you have evidence to the contrary! I think you should include the fact that you can use the Uber credits on food via Uber Eats, making it a useable perk more card holders. Good idea. Done. Wish they offered that service in Ann Arbor! Great summary Greg. One thing to add, the $1,000 certificate for Mercedes Benz is usually not stackable with other offers/promotions that the dealership runs. YMMV, but I tried to use this certificate (haggled dealer down to desired price, then whipping out the certificate, only to be told it can’t be combined). So its usage may not be as good as people would like. Also, if you have a choice between Morgan Stanley and Charles Schwab (for investment purposes, neglecting bonuses, etc), Charles Schwab is hands down the better investment vehicle with historic low ERs and great selection of funds for self-directed brokerage. Hope this helps. Does AMEX waive annual fee for SCRA for the Business Platinum as well? I’ve read conflicting reports about that, so I don’t know. If you try it please let me know whether or not it works! For the consumer cards, can you get the sign up bonus for each or only once for all? You can get the sign up bonus for each one. They are separate products. “Note that with consumer Platinum cards you can add authorized user Gold cards for no fee”. Does this mean I can transfer MR points to authorized user airline account. Do AUs on the Ameriprise really get the $100 Global entry fee credit? I thought that was just the primary….but hope I’m wrong. Excellent post. I got the Ameriprise Platinum last year with 25k bonus and no fee first year. Does anyone know how easy and how little and which type of account (is it only brokerage accounts) you need to open Morgan Stanley and Schwab account to qualify. I’d like to know that too. Has anyone tried signing up without any account? I did that last year successfully. Greg, I have the regular old Amex Plat. How hard is it to get approved for the Morgan Stanley one too? Or do they deny because I already have the plain one? With the Amex Centurion lounge guest limit, and I have a family of 5, it would make more sense to have the Morgan Stanley Plat so I can add hubby as a free AU and we can get everyone in. I’m assuming applying for the MS one and then cancelling the regular one is the prudent way to go? We don’t have Uber Eats in my town so it might be hard for me to use that credit every month on either card. I’ll try my hardest tho. Good idea. My bet is that you won’t have any trouble getting approved. Just make sure to use up this year’s $200 in airline fee credits before you cancel your regular Platinum card. I don’t think so. If you want to change, you’re better off applying new so that you’ll get the signup bonus. My AMEX platinum personal AF has just hit (received the statement today…$550). This is the only flavor of AMEX platinum I have had. I was thinking about cancelling it and perhaps applying for AMEX platinum Schwab since I have the brokerage/high yield checking for the debit card. I figure I may as well cancel it since I will just be paying 550 for no additional benefits, and if I am approved, I will get all the same benefits plus the 60k sign up bonus after 5k spend. I also have the Business Blue plus so I won’t lose by MR points that I still have. Any thoughts before I call up? My travel credits won’t hit again until the new year I believe on the current card, so should I apply today for the Schwab and be able to use twice by Jan? If so, should I call up to cancel Platinum personal first, or wait to see if I am approved for Schwab then call to cancel regular platinum personal? One small advantage of calling to cancel first is that they may offer you a retention offer that makes you want to keep the card. Other than that, yes I would absolutely do what you said. If you apply now for the Schwab card you could actually get $200 in travel credits before the end of this year if they send you the card fast enough (mine came within 2 days), then you can get the travel credit again in 2018, and again in January 2019 before deciding whether to keep the card for another year. Good suggestion. I’ll see what they can offer. Thanks. Just got off the phone with AMEX. They offered me either a 300 statement credit or 30k MR points to keep open and I have until Jan 7th to decide what to do. Would this allow me get another $200 travel credit if I purchase Jan 1 on this current card, then call in and cancel after the credit posts? Then I could decide to cancel? I could decide to keep it open, take one of the retention offers, and still apply for schwab today and get both of those travel credits as you said. 30K MR is a great retention offer. If it was me, I’d take it and keep the card open. You could always call again next December for the same reason. Amex is sometimes taking longer to issue travel credits, so I wouldn’t count on getting it before Jan 7. Another option is to wait until the credit posts and then if you are past the 30 day window to cancel, downgrade to a lower fee card (e.g. Green card for $95) and Amex will give you a prorated refund for the Platinum annual fee. What is working currently for flight credit reimbursement on Amex? If you’re playing the 2-playing game version, could you alternate years having the Ameriprise Plat? Wonder how long you could go before they caught on. The correct answer is all of them, and then the Amerprise again and again. You should awf the .35% v commission on 5k for morgan stanley card in the annual fee. Btw, 100% sue the MS card loophole will be closed now that it is on the radar of the locusts. Debit – Which loophole? Having an MS Access account? I opened and funded one in early December. I applied for the MS Plat 2 days later. After a little over a week I was approved. Are you saying the Access account is the loophole? Or are you saying that opening an MS Access account and not funding it is the loophole? Can you elaborate? Your post isn’t clear. Worth noting also that you can add up to 99 green card authorized users on the biz platinum that all qualify for global entry / precheck credit. Each of those users can create a separate login and will get thier own offers as well. Thanks. Isn’t that true with the consumer Platinum cards too in which you can add free Gold cards? Not sure but those cost $$$ don’t they? The annual fee for a green card a/u on a biz platinum is $0.00. Ahhh, did not know that. Do you know if they are also entitled to the $100 global entry / precheck credit? Thanks! Wow, that was a big unforced error on my part. Fixed. Great writeup, you’ve helped me finally decide…I’m dropping my Plat card altogether! Are Small Luxury Hotels exciting? What can make Greg love the S3? Those answers and more. No big deal, but in the “Which consumer Platinum card is best?” section at the end, you have that Schwab gives a $100 bonus for $200k in assets, whereas it’s $250k (which you have listed correctly higher up in the article). Thanks for the writeup. I got the 100k bonus on the regular consumer version last year, I intend to get the Schwab this year (and dump the current one) so I can redeem my points at 1.25 cents. I’ve got plenty of UR points that I can use for travel at 1.5 cents with the Sapphire. I think my strategy going forward will be Chase for non-airfare travel at 3x, Schwab Platinum for airfare at 6.25 cents per dollar redemption, and AmEx Blue Business for non-bonus spend at 2.4 cents redemption.